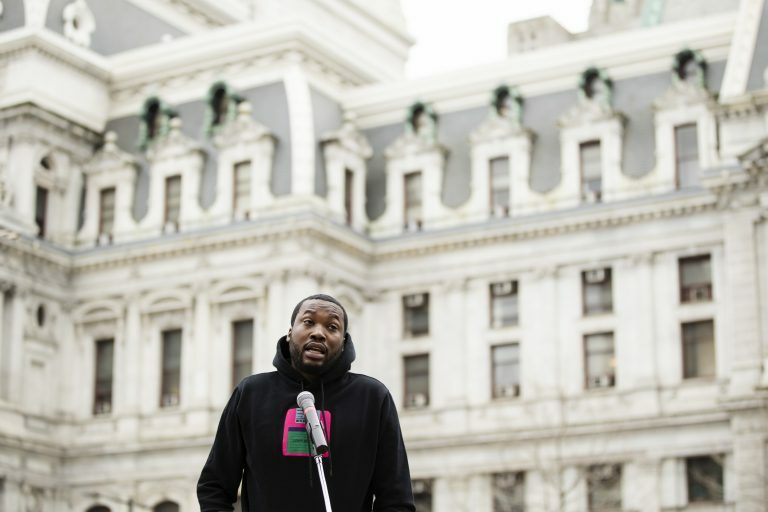 Encouraged by a coalition assembled by Philadelphia rapper Meek Mill, a bipartisan effort is underway in Harrisburg to reform Pennsylvania’s system of probation and parole. 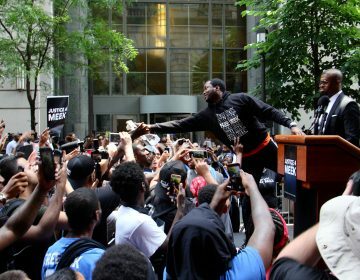 Speaking Tuesday in the shadow of Philadelphia City Hall and the Criminal Justice Center, Meek Mill said too many defendants are unfairly incarcerated for meaningless violations of probation and parole. State Rep. Jordan Harris, the House Democratic whip, said he intends to introduce a bill designed to result in fewer people on probation and for shorter periods of time. 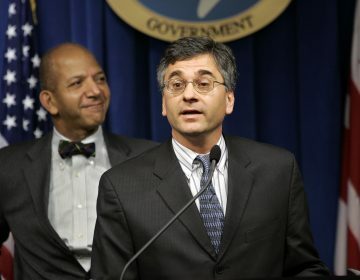 Harris, who represents a Philadelphia district, wants to end the practice of extending probation when fines and fees aren’t paid, give defendants credit for good behavior and cut time off supervision for completing educational or vocational classes. He said more than half of those behind bars are there due to violating the terms of their parole and probation. “The time is up for a system that oppresses people and doesn’t lift them up,” he said. Harris also wants to prevent putting probationers back behind bars if they test positive for the use of marijuana, associate with people who have a criminal history or travel outside their jurisdiction. He argues courts should not be issuing consecutive sentences of probation or extending probation or parole over nonpayment of fines and costs alone. The proposed changes would affect county and state probation and parole. Mill’s Reform Alliance is designed to pass probation and parole bills at the state level as it works to change public opinion about ex-offenders. Mill became a symbol for those trying to improve the probation system when he received a 2- to 4-year prison term for probation violations in a decade-old gun and drug possession case. He spent months in prison before a court ordered his release. Rep. Sheryl Delozier, a Republican from the Harrisburg suburbs who was also a part of the announcement Tuesday, said there ought to be a balance between supporting police and giving people who have served their time the ability to return as productive members of society. Harris said he was encouraged by conversations with Republicans and law enforcement about proposed changes. He expects to have legislation drafted in the coming weeks. “The fact that we’re all at the table discussing this issue is a sign that everybody is committed to getting this done,” Harris said. A similar proposal to reform probation has been introduced as a bill in the state Senate. State lawmakers last year passed legislation that automatically seals lower-level, nonviolent crimes from public review after 10 years. The “clean slate” legislation also seals records of arrests that did not result in convictions. The convictions are not expunged, and records of them are still available to police, courts and prosecutors. Access to all summary convictions that are 10 years old is restricted, as long as the defendant has fulfilled court-ordered obligations. Pennsylvania has also recently stopped suspending drivers’ licenses for those convicted of drug offenses unrelated to driving and expanded the use of DNA evidence for those already convicted. 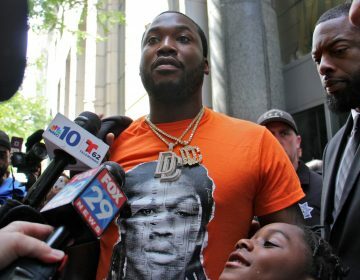 A Philadelphia judge has denied Meek Mill's petition for a new trial in his decade-old drug and gun convictions despite support for the request by the DA's office. Mill and his lawyers are asking for a new trial on a 2008 conviction on drug and gun charges. 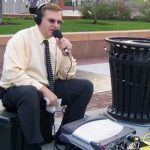 Pennsylvania holds the dubious distinction of having one of the largest populations of people under court supervision in the country.